Donald Trump might have just defamed James Comey. He might have. But the remedy is unclear. 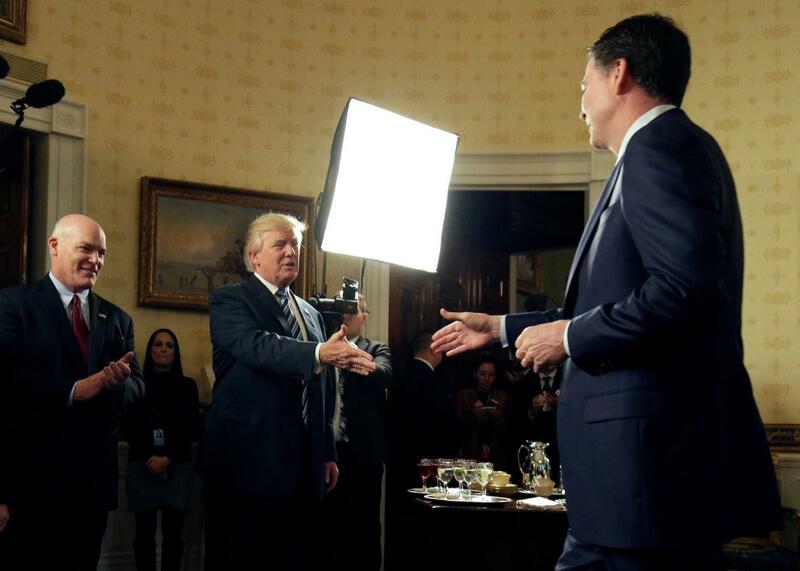 President Donald Trump greets then–FBI Director James Comey in the Blue Room of the White House on Jan. 22. In March, President Donald Trump accused President Barack Obama of wiretapping him. At the time, I wrote that in the unlikely event that Obama were to file a defamation claim against his successor, the former might have a case. Now comes the potential for another defamation claim—this time by former FBI Director James Comey. He and Trump are exchanging charges of mendacity, and a defamation claim might be one way to resolve them. As with the statements about Obama, the issue—if Comey were to choose to pursue it—would likely come down to the limits of executive immunity from lawsuits. At Thursday’s hearing before the Senate Intelligence Committee, Comey explained his decision to memorialize his meetings with the president by expressing his worry that Trump “might lie about” their meetings. In defending both himself and the FBI against charges that the organization was “in disarray,” Comey bluntly stated: “Those were lies, pure and simple.” He said that—in these prior statements—the administration and the president had defamed him and the bureau. In a statement following the testimony, meanwhile, Trump and his lawyer directly accused Comey of lying under oath. This statement also accused Comey of “illegal leaks of classified information and privileged communications.” Finally, at a news conference on Friday, Trump said that Comey’s testimony that the president had asked him for “loyalty” and had asked him to “let go” of the Flynn investigation was false, essentially accusing the man of perjury. He even promised to testify as much under oath. In almost any other situation, such accusations, if false, would be an easy case for defamation—even though such cases are generally very tough to win. Some background on defamation will help. This tort claim protects reputation, which Shakespeare called “the immediate jewel of [our] souls.” Accusing someone of lying—under oath, in this case—is sure to harm the good name of the accused. And even if Comey can’t prove he was damaged by the charge, in defamation cases the harm is generally presumed in cases where the statement is libel (written defamation) rather than slander (spoken defamation). Tweets would qualify as libel. In cases involving public figures, the Supreme Court has applied an additional requirement: The false statement must be made with “actual malice.” That’s a legal term meaning that the defendant must either know the statement is false or act “in reckless disregard” as to whether it was true. These additional requirements shouldn’t pose a problem in this case, because Trump knows (or certainly should!) whether the statements are true or false. Of course, any Comey lawsuit against Trump for defamation would be met with a more elaborate version of the accusatory tweet: “I didn’t lie, Comey did.” To succeed, Comey would have to show that Trump’s charge was false. Unless there are tapes, lordy, proving the point one way or the other, the issue would come down to whether a civil jury would believe Comey or Trump. I’ll leave the question of each individual’s personal veracity alone, except to mention Comey’s response to a question about why people should believe him instead of Trump: “I think people should look at the whole body of my testimony.” In the same answer, he drew attention to the “significant” fact that Trump kicked everyone out of the room before allegedly expressing the “hope”—which was read as a directive—that Comey would let the Flynn investigation “go.” This, on top of the fact that Comey documented his version of this conversation in a memo immediately after and shared it with several contemporaneous witnesses, might bolster his case. But if there isn’t a tape of their conversations, it could still ultimately come down to he said–he said. During the hearing itself, the Republican senators—for the most part—knew better than to attack Comey’s credibility and chose instead to undermine the suggestion that Trump’s statements amounted to obstruction of justice. Trump has also called Comey out for “leaking” the memorandum describing his closed-door meeting to a friend, supposedly in violation of, well, something, that his lawyer didn’t clearly define. The charge that Comey did something illegal here appears to be groundless and thus could equally be the subject of a defamation claim if he could prove in court that he hadn’t illegally leaked anything. As I explained in March, it seems very unlikely that the always-sanguine former President Obama would bring such a suit. It’s unclear whether that’s true of Comey. Trump did fire him, call him a “nut job,” and has now flatly called him a liar. He may have had just about enough; he’s already publicly accused the president of trying to “defame” him and the entire FBI. A lawsuit would underscore the point. Yet Comey’s a smart lawyer who knows that his claim would face one very steep obstacle: presidential immunity. The Supreme Court has held that the president enjoys broad immunity from civil liability for official acts committed while in office. Were the tweets and his lawyer’s statements “official acts”? The law isn’t so clear, and it doesn’t help Trump that the tweets were sent from his private account rather than his presidential account. There’s been a lot of discussion lately about whether these 140-character eruptions constitute the official White House position; a defamation lawsuit based on tweets would draw that question into dramatic relief. On the side of liability, it’s hard to argue that falsely accusing someone of lying under oath should be protected conduct. As I mentioned in the Obama defamation piece, surely there’s some limit to what even a president can get away with: Had Trump punched Comey, no one would be arguing for immunity. But for statements made about what was, or wasn’t, said during a meeting between the president and another high-ranking public official, perhaps the best remedy lies within the political process, up to and possibly including impeachment. Comey might get no relief there, of course, since the current leadership in both the House and the Senate seems prepared to ignore or excuse anything the president does. In that case, Comey would have to take comfort in the prospect that most people—including the very Congress members and senators who seem unwilling to hold the president accountable for these possible lies—are likelier to believe him than the president of the United States. Disclosure: James Comey and the author were once well-acquainted, but haven’t seen each other since 1986 and have exchanged only a couple of email pleasantries since then.